The exciting model lifestyle appeals to a lot of young women nowadays and this entices them to model. 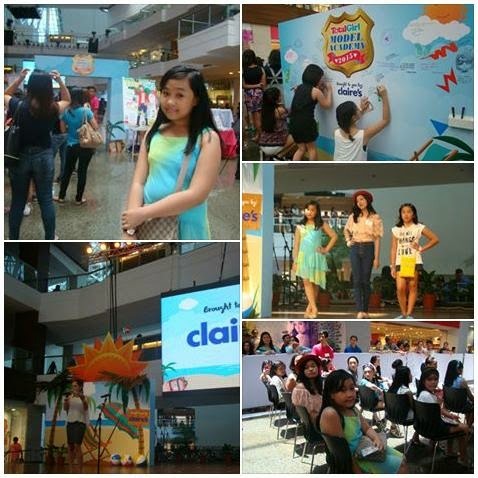 A bevy of tweens between the ages of 8 and 14 flocked to the Total Girl Model Academy today at the Glorietta Activity Center to make that jump. The first and only lifestyle magazine for tween girls held this event to teach them everything they should know about modeling. The Total Girl Model Academy gives girl model aspirants the valuable skills that are important in ensuring their survival in the modeling business. More than 190 young hopefuls went through a series of workshops before the go-see finale. Each participant received a passport upon entering the venue, which guided them through the different stages. Each stage was led by professional mentors who helped them hone their styling and modelling skills. The first stage was the styling studio where they discovered their own style. Raizel Dy, a fashion stylist and make-up artist who worked in some of the country’s fashion magazines, imparted stylish ideas that the girls can improve on to help them shine bright. Then at the second stage, they proceeded to the catwalk class where they flaunted their styles through ramp modelling, proper posture, and personality coaching with Ning Corteza, an instructor of runway modelling, imaging, and visual posing. How to rule in print was next at the third stage. Girls learned basic camera posing where they found their best angle with the help of Photography Coach Heidi Aquende, a commercial and editorial photographer. The fourth stage gave them a chance to practice what they learned from the previous stages. The photo booth produced “comp cards,” otherwise known as model’s set cards, for participants to take home as souvenirs. The last stage is the final test of this event: the go-see. On the runway, the aspirants applied everything that they’ve learned from the entire workshop. They did their best in front of a panel of judges, who were looking for the next, sweet young thing. The editorial team of Total Girl will choose 10 winners to be featured in Total Girl’s September 2015 Fashion and Beauty issue. Aside from being featured, the winners will also get special prizes from the sponsors. The winners will be announced on the May 29th and will be contacted directly by the Total Girl team. Total Girl Model Academy is a great opportunity to empower young girls to live their best tween lives ever---being confident, cool, and fun! This is definitely one memorable summer experience for all who joined in. For updates on the Total Girl Magazine, like www.facebook.com/totalgirlmag.ph on Facebook and follow @TotalGirlPH on Instagram. Visit https://www.summitnewsstand.com.ph/total-girl for more details.